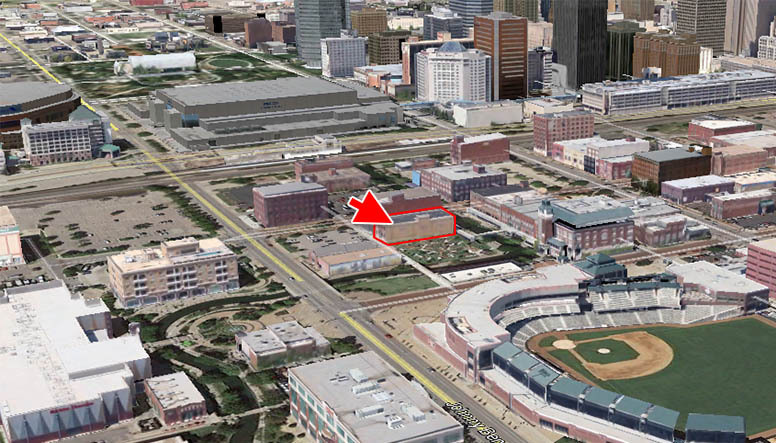 Preliminary plans reveal the intention to convert a key Bricktown Canal property into an events center. 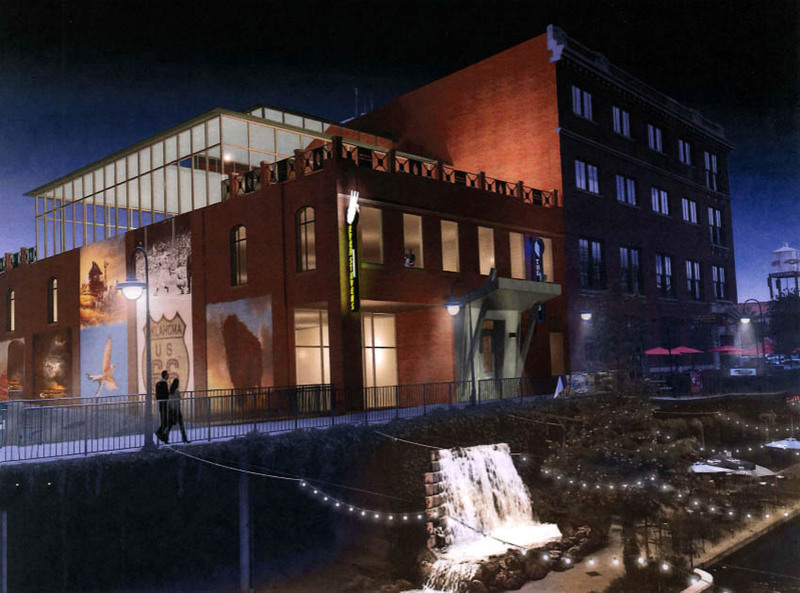 The Falls Event Center based in Salt Lake City have filed drawings that show a 3rd level being added to the existing 2-story structure at 108 E. California and a waterfall that would be at the basement / canal level. 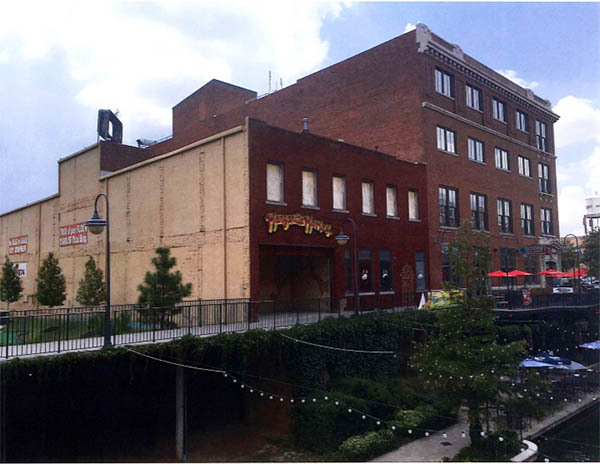 Renderings also indicate a large outdoor terrace facing the canal and new Oklahoma-themed murals on the eastern wall, a highly visible facade that currently features plain paint and for sale signs. The building is currently owned by Gary Cotton who declined comment when reached by phone. OKCTalk has learned this property is under contract for sale, presumably to The Falls group. The existing structure was last home to Margarita Mama's but has been vacant for a decade. It features two levels of 7,000 square feet each and the same amount of area in the basement. Several years ago, Cotton sold the property to the immediate east which is now home to miniature golf and Brickopolis. Cotton had originally planned an ambitious mixed-use project called the Cotton Exchange but could not obtain financing and ultimately put the properties on the market. To the immediate west of 108 E. California is the Kingman Building, which is home to Yucatan Taco Stand, Bourbon Street Cafe and offices. Directly across the canal, Miracle pop-up bar is occupying the old Captain Norm's space which will become the permanent Plundr bar in early 2017. Further West, the owners of the Case Plow Building recently revealed plans for a major renovation and just to the west of that, the Santa Fe Station is being renovated into a multi-modal transportation hub which will include direct access to the canal area upon completion of a new tunnel and plaza. Just to the south and west, The Plow Building has recently completed a comprehensive renovation and is filling with office tenants with at least one restaurant planned as well. I'm going to say that faux waterfalls covering the canal-level in Bricktown are probably not code-compliant. That said, I'm sure they'll get a variance, when you consider everything else that's cheesy, non-compliant, approved and/or existing. Otherwise looks like a great project. I like these event center concepts bc they aren't necessarily tied to set operating hours, which is a challenge in a district like Bricktown, where it's either full-throttle busy or totally dead. Without set hours they're more flexible and likely to bring in crowds off-peak... whatever that may be in OKC... prayer lunches, corporate gatherings, office holiday parties, Bishop McGuinness birthdays, etc etc. This establishment would also include a regular-hours restaurant component. I'm not going to get into other items as Steve filed a story last week due for publication on Tuesday that fills in other details and includes interviews. Interesting... I don't really like the use. Private event venue with a sandwhich shop? Yawn. Open for breakfast/coffee, lunch and dinner and serves beer. Sandwiches are at least marginally healthier than burgers that are aplenty in the state. Plus, it's a chain that I don't believe is currently in the state, which I think is good. People from out West visiting OKC may be excited to see this (I don't know anything about it, these are just assumptions) as something familiar for them. And as more people begin to live immediately in and around downtown and related districts, this venue could have steady clientele. But, did I read correctly that the last time this building was occupied was 2002? So I don't think we can be too picky here. I'm glad it's going to be renovated and made into something and wish the owners success. Better than nothing. It's a $10 million renovation. This thing is going to be top notch. There are nothing but glowing reviews on Yelp for The Falls Salt Lake City. I like it. 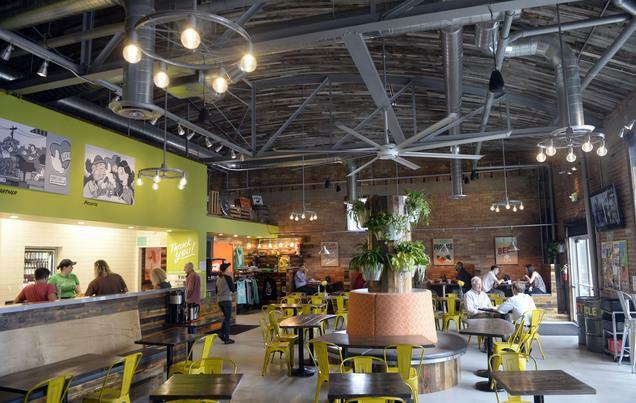 Not enough low-cost fast-casual type lunch options in Bricktown; especially north of Reno. The charity component makes it nice too. The upper floor event space to me is not much different than office; and honestly event space is somewhat lacking right now believe it or not. But i have a serious question, is there still intention of the golf coarse to be developed? I ask because if so this 'could' impact what might be approved since the 'falls' would have been first and might object to a -say- 12 floor hotel that would likely wipe away the views of the 3rd floor addition/rooftop. The Golf course is already there. They can protest all they want, but if this imagined hotel comes to fruition, their protest is null. If something fits in the development guidelines and can be built, then that's the way that it is. Anybody who owns anything downtown – from single-family home owners all the way up to Devon and everyone in between – needs to understand that if they want to maintain "a view" then they are obliged to buy whatever lots that could potentially be developed to block said view and develop those lots themselves. Whoever eventually buys up the mini-golf course lot and develops it should not be counting how their next-door neighbor's view is affected among their top 5 concerns. It seems like they are betting on a hotel not going in anytime soon given the amount of money they are spending on that side of the building. I'm not so much worried about that, but it DOES prevent this building coming down in order to build a larger new development. The Cotton Exchange was going to include this building's footprint. The smaller lot with the mini-golf course is tiny, really. It will make it hard for anything substantial to go on that corner. But i do like this project for all the reasons previously stated. I would think they would love for a hotel to go in next to them. That would certainly benefit their event space. I'll take the smaller lot to retain more historic building fabric. And that lot is plenty large enough for even a 10-12 floor development, ESPECIALLY assuming the current Brickopolis building would be incorporated into the development as a "front door." Agree. That space is more than adequate size for a hotel. I wonder what the possibility would be of making an inlet in the space just south of Brickopolis for cars to pull up to for such a hotel. If so, they could put a bell station there for hotel employees to take luggage and park cars. Actually Brickopolis was designed specifically to itself serve as the drop-off for whatever ends up on that corner lot. This could either be via a sheltered drop-off in the existing Brickopolis parking area (with a pedestrian bridge) or a vehicular bridge wherein you would drive under Brickopolis across a bridge, and into a turnaround or circle or whatever, before being returned either under the building or into the alley. The design was pretty clever in this regard. And make no mistake, if the corner were developed the owner of the land (and Brickopolis) would willingly if not enthusiastically part with the existing building. All of this was designed to give the corner (currently housing the mini golf) a front door on Mickey Mantle rather than on the alley. I've explained this over the years but I think people won't get it until they see a drawing of some sort. Do you think the chances of a development coming on the mini golf lot are improving? I think a hotel would crush it on that lot. The owner has entertained several offers already, but he's happy enough with the present performance of Brickopolis and the mini golf in particular that he feels he can/should be very selective about the deal he takes. It WILL be redeveloped. The question is whether that happens a year from now, or three, five or ten years from now. I'm guessing it's somewhere between three and five. Thanks for the info. I've always thought that would be a great location for a hotel. Glad to know he's being selective and not just taking the first good offer. That's a true community steward. 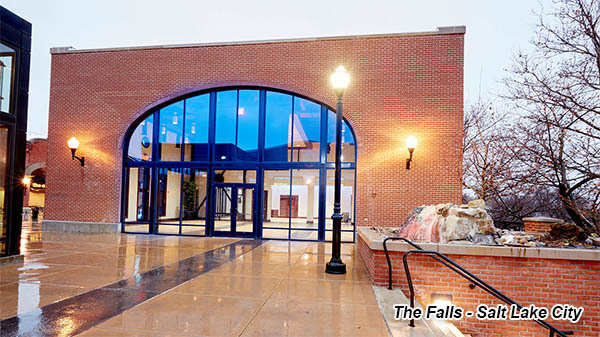 OKLAHOMA CITY – The Falls Event Center wasn’t supposed to be in Bricktown. 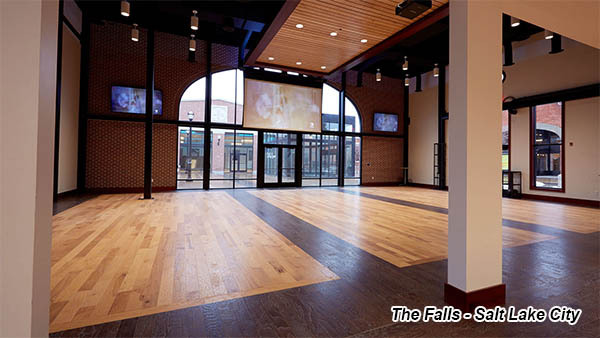 Corporate General Manager John C. Neubauer said the Utah company’s retail consultant was staying in Bricktown while trying to find a suburban site for an Oklahoma City event space. Then the consultant saw the real estate sign on the 108 E. California Ave. building. It sits on the north side of Reno Avenue, with a tan wall facing east. Neubauer said the company expects to buy the building in January. 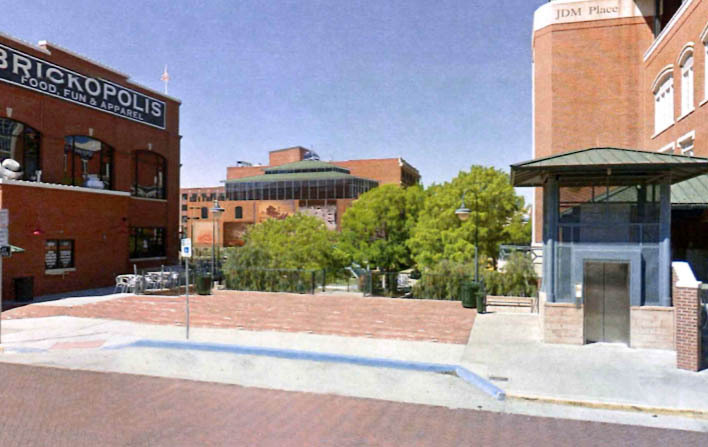 It will return to the Bricktown Urban Design Commission for design approval in February. 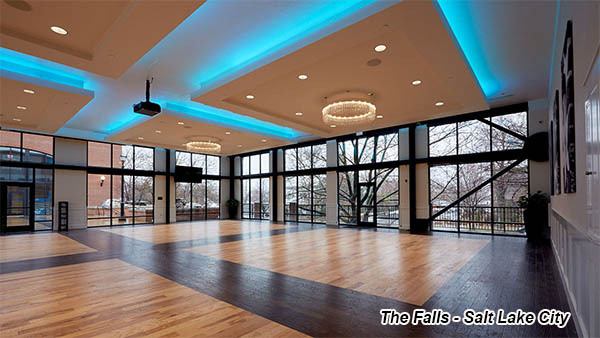 Neubauer said The Falls is spending about $10 million on the project, which includes purchasing the building. It will not seek historic tax credits. During Wednesday’s Bricktown meeting, Pontis Architectural Group architect Alan Shurtliff presented the planned renovations to the commission. Neubauer said it was important to the group to work with the city on its plan. The renovation calls for a glass-enclosed area on top of the building. There will be several rooms inside the building, ranging in capacity size from 50 people to 300 people. Neubauer said The Falls will not have an on-site caterer. Customers can bring their own catering, or choose from a provided list. There’s no additional fee if someone does not choose from the list, he said. “We only have the list in the event that the guest asks for help,” he said. The building stretches down to the canal level, where a waterfall is being built. Engineer Tim Johnson said he is working with the city’s parks department on the water installation. Before any interior renovation can start, the building needs some structural work. Structural steel will be installed to help provide support, said Shurtliff. Shurtliff said there are also plans to put bricks on the east-side wall. Neubauer said The Falls will work with the Bricktown Association on getting a mural on the east wall as well. Commissioner and longtime Bricktown business owner Avis Scaramucci said the building is an eyesore. She said previous occupants have not stayed long. The basement level will not have an occupant at this time. It was previously announced that the Even Stevens sandwich shop would fill some of the space, but Neubauer said those plans have changed. He said the company’s due diligence found that Bricktown was not an ideal place for its business. Neubauer said The Falls will open in 2018. ^ What are we to think of that? Perhaps the turnover of restauarants in the district is what scared them off?